If ‘Go Camping’ was the marketing catchphrase used to lure our parents to the great outdoors, then ‘Go Glamping’ is what’ll get this generation of millennials to follow suit. Yes, sometimes you have to tempt us with luxury. Glamping, of course, is a fusion of the words ‘glamourous’ and ‘camping’, which is pretty much the standard way young professionals spend their weekends in the forest these days. 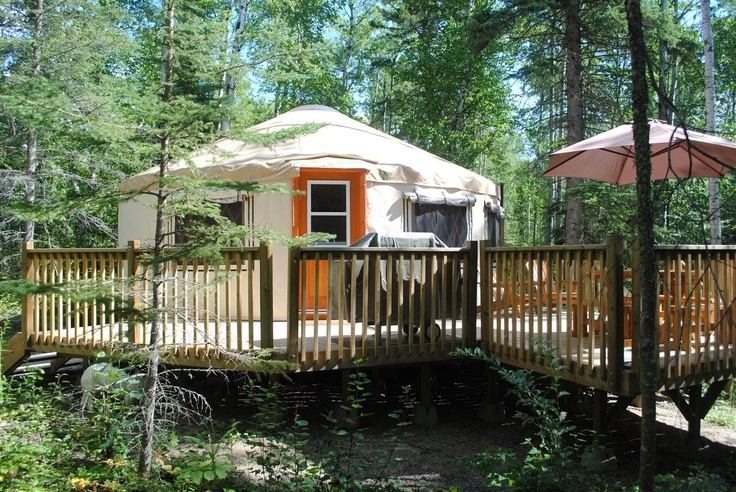 So whether you require Wi-Fi, five-star meals, queen-size beds, or just a protective layer between you and the mosquitoes, here are 7 of Canada’s best glamping options. Rates start at around $5,000, which just about tells you everything you need to know about Clayoquot’s exquisite offerings. Take in the breathtaking beauty of the Canadian wilderness with a side of five-star cuisine, world-class spa services, and Wi-Fi. The luxury tents are stocked with more than you’ll find in a standard hotel room, including micro-fleece bathrobes and books. The resort’s commitment to sustainability and the environment add a feel-good touch to your high-end escape. Just a 90-minute drive from Montreal, Entre Cîmes et Racines offers 11 ecoshelters that connect you with the rhythm of nature without sacrificing the luxuries of civilized life. You’ll have access to both mountainous terrain and water with plenty of outdoor activities at your disposal. At Free Spirit Spheres, you will literally be a free spirit in a sphere. You’ll be completely removed from the ground, hovering above in a private forest canopy that’s both luxurious and magical. These unique bulbs are wired for power and come with speakers, a small kitchenette, dining table, and reasonably comfortable bed. It’s also an ideal solo escape – one look at the testimonials and you’ll be sold. Take in the wilderness with the comforts of home at one of Ontario’s most pristine outdoor escapes. You’ll spend your days ziplining, kayak fishing, and mountain biking with the knowledge that a mini fridge, private deck, electricity, hot shower, and hardwood floors await back at camp. Wilderness Suites also offers a very intriguing corporate retreat option for those who like to mix work with adventure. Driving the plains of Saskatchewan to arrive at Christopher Lake is anything but glam, but all that will change once you settle into one of Flora Bora’s fully equipped yurts. Your forest paradise comes with a private bathroom, kitchenette, deck, with nature trails and fruitful gardens just steps beyond the front door. Sundance Lodges features Canada’s premiere offering of teepees, which come with wood-frame beds with foam mattresses, wooden floors, and kerosene lanterns and heaters. You’ll be blessed with the stunning Rocky Mountains as your backdrop and the picturesque Kananaskis River at your feet. All of this is just an hour’s drive from Calgary. 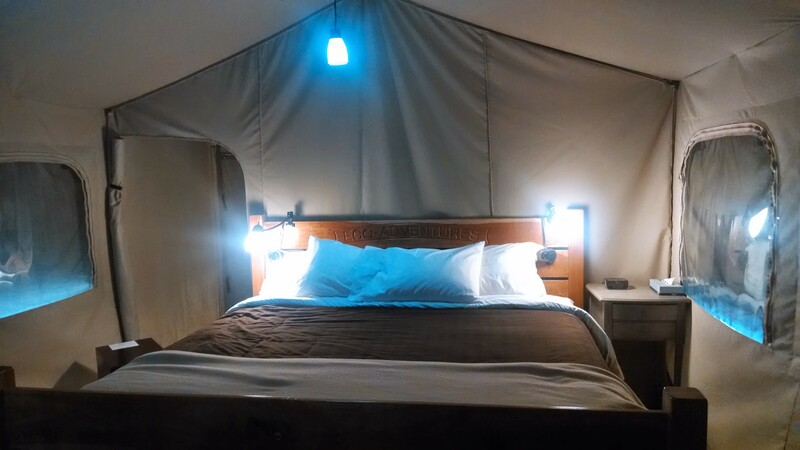 Dozens of parks and campgrounds nationwide have the option to stay in an oTENTik cabin-tent hybrid, an upscale accommodation for up to six people complete with hardwood floors, minimal furniture, an outdoor patio, and sufficient shelter from the elements. A full listing of oTENTik sites can be found here.